Go from a zero to a BIM hero with the latest ebook from 3D design and data management specialist Cadassist. An Autodesk gold partner authorised training centre, Cadassist can guide you through the BIM landscape with a range of classroom, bespoke and elearning courses. This ebook provides an in-depth look at Autodesk FormIt, a conceptual tool that aims to support you on the full BIM journey, from the initial idea right through to project delivery, allowing design to take place anytime and anywhere, without limitations or constraints. Best of all, FormIt is free to professional users. Whether sketching a 3D building concept in a web browser or conducting multiple energy analysis runs in the earliest stages of a project, FormIt allows for better design decisions from the very start – and when combined with mobile apps such as Autodesk Sketchbook Pro and Autodesk Graphic, it allows users to create whole presentations on the go. Impressive as it is, technology is only half of the BIM story. Training realises its true potential. 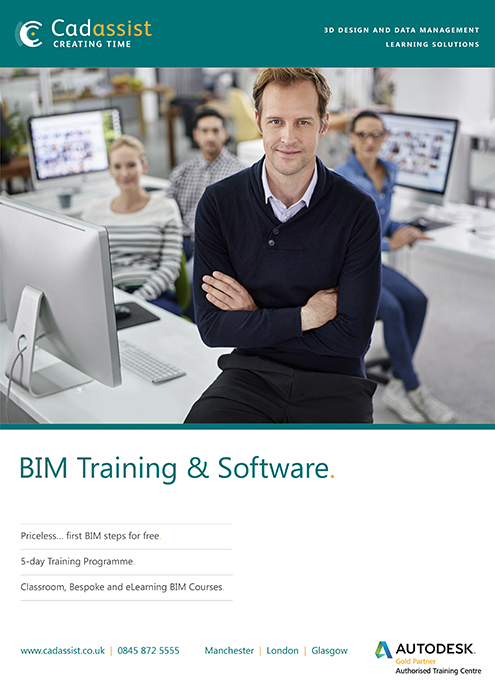 This ebook contains a wealth of information on the wide range BIM training courses on offer from Cadassist. The 5-day Zero to BIM Hero programme offers an immersive experience that will train you in the latest BIM competencies with Autodesk’s Revit software, covering architecture essentials, concept design and collaboration. The ebook also offers an extensive guide to Cadassist’s wide range of other BIM training courses, which cover everything from the essentials of different software to standards and management, content creation and tackling design problems. Dates are included for these half-day, full-day and multi-day courses in Glasgow, London and Manchester.